They're still ready for Armageddon at the Church Universal and Triumphant, a religious sect that for almost two decades has kept a bomb shelter stocked for 750 people deep in a forest near Yellowstone National Park. Church leader Elizabeth Clare Prophet has been silenced by advanced Alzheimer's disease. And her followers say they've given up the assault rifles and armored vehicles they amassed in the late 1980s - part of a post-nuclear war "re-emergence" plan that brought national notoriety and a federal investigation. Scrambling to stay current as it reaches its 50th anniversary, the church has transformed itself into a New Age publishing enterprise and spiritual university. But still in the background is its "insurance" against the end - the shelter buried beneath a hillside on the sect's 7,500 acre Royal Teton Ranch. There, more than 20 feet underground, 22,000 hours of video and audio recordings of Prophet survive. They're stacked alongside periodically rotated, floor-to-ceiling crates of canned fish, dried meats, grains and cooking oils. "Like Benjamin Franklin said, an ounce of preparation and prevention is worth a pound of cure," said Lois Drake, the church's co-president. On the grounds of the ranch - the picturesque mountain property just outside Yellowstone the group purchased from billionaire Malcolm Forbes - most of the decrepit trailers and worker's shacks that once housed 700 of the church's most faithful are gone. In their place has risen a large, two-story office building. Behind the walls of a quiet lobby furnished with antiques, workers in cubicles busily translate Prophet's words into 27 languages. Nearby, a sparkling new chapel known as King Arthur's Court hosts regular conferences such as the recent "Prayer Vigil for the God-Victory of the Elections and the Economy." Church wares, available online or from its gift shop, range from a wallet-sized "Chart of Your Divine Self" - $1.25 apiece - to a framed portrait of Elizabeth Clare Prophet for $239.95. The church's publishing arm, Summit University Press, has sold more than 3 million books in the last decade. The church's parent organization, Summit Lighthouse, was founded by Elizabeth Prophet's first husband, Mark, who spent years touring and preaching from a gold-painted Trailways bus. After his death in 1973, Elizabeth Prophet eventually relocated the sect from California to Montana. She preached from an altar crowded with icons from the world's major religions, mixing western philosophy and mysticism with a dose of Reagan-era patriotism - and, by the mid-1980s, warnings of nuclear war with the Soviet Union, according to her daughter Erin, who has since left the church. To ensure its survival, Erin Prophet said, the church spent an estimated $20 million to build the massive shelter near Yellowstone and many smaller ones in surrounding communities. As members amassed weapons for post-apocalypse protection, Elizabeth's Prophet's then-husband, Ed Francis, and at least one other church member were convicted of violating federal gun laws after purchasing some of the guns illegally. In March 1990, thousands of church members who had descended on the Yellowstone area entered the shelters to await the end. In a new book called "Prophet's Daughter," Erin Prophet said her mother had predicted Soviet missiles were on the way. Church leaders today insist the incident was a drill. After the predictions of doom went unrealized, the church gave up its firearms under an agreement with federal authorities. As Elizabeth Prophet's charismatic presence faded, most of her followers left or moved into the nearby towns of Livingston and Bozeman. Observers estimate that fewer than 10,000 remain, from a peak of 50,000. Church leaders refuse to give a number, saying membership information is "proprietary." Those adherents say their mission is no longer to absorb Prophet's message, channeled from on high, but to disseminate her words through books, CDs and online tutorial services. With spiritual teachings now offered over the Internet, the long-term goal is to expand beyond the church's "physical community" and create an "online community", said its second co-president, Kate Gordon. "It's time to get in touch with Facebook," she said. At a recent Sunday service at the church's teaching center in Bozeman, about 30 of the still-faithful gathered in a room hung with portraits of Jesus, George Washington and St. Germain. 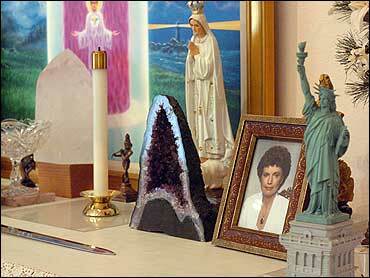 A table at the front of the room displayed small statues of Buddha and the Virgin Mary. A sword and dagger lay near a replica of the Statue of Liberty. The church's Rev. Carla Groenewegen invoked Christopher Columbus and Camelot's legendary wizard Merlin as spiritual guides, then led the congregation in singing "Battle Hymn of the Republic." A video on a large flatscreen TV showed Elizabeth Prophet delivering a 1992 sermon in Atlanta - closing her eyes and channeling messages from the "ascended masters" with a trancelike voice. While Prophet's warnings of Armageddon never materialized, church members say a quick glance at the news - global financial instability, terrorism, wars in Iraq and Afghanistan - suggests the doom she forecast is still unfolding. "What we believe is that it has been happening for a number of years. It's not over," Drake said. She refers to the shelter as "an insurance policy." Its main denizen these days is Michael Galloway, a church employee and coach for the local high school ski team. He's maintained the shelter for the past 15 years - making sure the stacks of food don't spoil, flashlights have fresh batteries and mice populations are kept in check. Inside sleeping compartments that line a long, narrow corridor are bunkbeds. Many are stacked with bags of clothes and other personnel effects from church members who never returned in the wake of the 1990 prophesy. As Galloway exited through the shelter's heavy steel doors - past shipping containers stocked with camping supplies and other equipment - he said the facility was stocked with enough food, water and fuel to last 750 people for 49 days. "Even after all these years I don't find it spooky at all," he said as he stepped into the outside world. "I find it peaceful."